Malicious software poses an ever-increasing threat, not only due to the number of malware programs increasing, but also due to the nature of the threats. Infection vectors are changing from simple file-based methods to distribution via the Internet. Malware is increasingly focussing on users, e.g. by deceiving them into visiting infected web pages, installing rogue/malicious software or opening emails with malicious attachments. The scope of protection offered by antivirus programs is extended by the inclusion of e.g. URL-blockers, content filtering, reputation systems and user-friendly behaviour-blockers. If these features are perfectly coordinated with the signature-based and heuristic detection, the protection provided against threats increases. 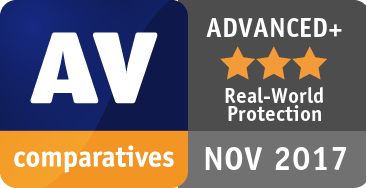 In spite of these technologies, it remains very important that the signature-based and heuristic detection abilities of antivirus programs continue to be tested. Even with all the protection features available, the growing frequency of zero-day attacks means that some computers will inevitably become infected. As signatures can be updated, they provide the opportunity to recognize and remove malware which was initially missed by the security software. Other protection technologies often offer no means of checking existing data stores for already-infected files, which can be found on the file servers of many companies. Those security layers should be understood as an addition to good detection rates, not as a replacement. Every potential test-case to be used in the test is run and analysed on a clean machine without antivirus software, to ensure that it is a suitable candidate. If the malware meets these criteria, the source URL is added to the list to be tested with security products. Any test cases which turn out not to be appropriate are excluded from the test set. The tests were performed under a fully patched Microsoft Windows 10 64-Bit. Some further installed software includes: Adobe Flash, Adobe Acrobat Reader, Apple QuickTime, Google Chrome, Oracle Java and VideoLAN VLC Media Player. The use of more up-to-date third-party software and an updated Microsoft Windows 10 64-Bit makes it harder to find exploits in-the-field for the test. Users should always keep their systems and applications up-to-date, in order to minimize the risk of being infected through exploits which use unpatched software vulnerabilities. Our Whole-Product Dynamic Protection Test aims to simulate real-world conditions as experienced every day by users. If user interactions are shown, we choose “Allow” or equivalent. If the product protects the system anyway, we count the malware as blocked, even though we allow the program to run when the user is asked to make a decision. If the system is compromised, we count it as user-dependent. We consider “protection” to mean that the system is not compromised. This means that the malware is not running (or is removed/terminated) and there are no significant/malicious system changes. An outbound-firewall alert about a running malware process, which asks whether or not to block traffic from the users’ workstation to the Internet, is too little, too late and not considered by us to be protection. Every morning, any available security software updates are downloaded and installed, and a new base image is made for that day. Before each test case is carried out, the products have some time to download and install newer updates which have just been released, as well as to load their protection modules (which in several cases takes some minutes). If a major signature update for a product is made available during the day, but fails to download/install before each test case starts, the product will at least have the signatures that were available at the start of the day. This replicates the situation of an ordinary user in the real world. Security products should protect the user’s PC and ideally, hinder malware from executing and perform any actions. It is not very important at which stage the protection takes place. It could be while browsing to the website (e.g. protection through URL Blocker), while an exploit tries to run, while the file is being downloaded/created or when the malware is executed (either by the exploit or by the user). After the malware is executed (if not blocked before), we wait several minutes for malicious actions and to give e.g. behaviour-blockers time to react and remedy actions performed by the malware. If the malware is not detected and the system is indeed infected/compromised (i.e. not all actions were remediated), the process goes to “System Compromised”. If a user interaction is required and it is up to the user to decide if something is malicious, and in the case of the worst user decision the system gets compromised, we rate this as “user-dependent”. Because of this, the yellow bars in the results graph can be interpreted either as protected or not protected (it’s up to each individual user to decide what he/she would probably do in that situation). We aim to use visible and relevant malicious websites/malware that are currently out there, and present a risk to ordinary users. We usually try to include as many working drive-by exploits as we find – these are usually well covered by practically all major security products, which may be one reason why the scores look relatively high. The rest are URLs that point directly to malware executables; this causes the malware file to be downloaded, thus replicating a scenario in which the user is tricked by social engineering into following links in spam mails or websites, or installing some Trojan or other malicious software. We use our own crawling system to search continuously for malicious sites and extract malicious URLs (including spammed malicious links). We also search manually for malicious URLs. The dendrogram (using average linkage between groups) shows the results of the hierarchical cluster analysis. It indicates at what level of similarity the clusters are joined. The red drafted line defines the level of similarity. Each intersection indicates a group (in this case 4 groups). Products that had above-average FPs (wrongly blocked score) are marked in red (and downgraded according to the ranking system below). The false-alarm test in the Whole-Product Dynamic “Real-World” Protection Test consists of two parts: wrongly blocked domains (while browsing) and wrongly blocked files (while downloading/installing). 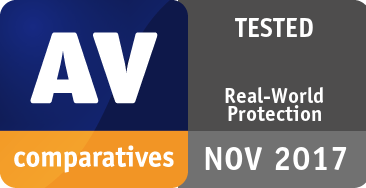 It is necessary to test both scenarios because testing only one of the two above cases could penalize products that focus mainly on one type of protection method, either URL filtering or on-access/behaviour/reputation-based file protection. To determine which products have to be downgraded in our award scheme due to the rate of wrongly blocked sites/files, we backed up our decision by using statistical methods and by looking at the average scores. The following products with above-average FPs have been downgraded: Seqrite, Symantec, Fortinet, BullGuard, Microsoft and F-Secure. According to some vendors, their own FPs are not seen at all in their user base (zero prevalence) or have a very low prevalence. Nevertheless, we want to give the best possible overview of prevalence data for the benefit of users of all our tested products. The table below shows the number of FPs for each product per our amalgamated prevalence assessment, for which we used several sources of prevalence data. 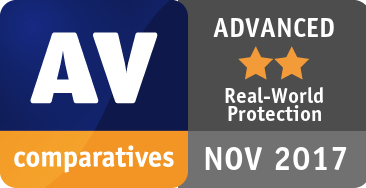 Expert users who do not care about wrongly blocked files/websites (false alarms) or user-dependent detections, are free to rely on the protection rates instead of our awards ranking which takes those in consideration.